File management is not a complex task with a GUI based app. But if you’re a programmer, it is tough to write a piece of code or implement an algorithm programmatically to maintain the data and hierarchy of files. The OS takes care of creating folders and files on mobile devices and computers. It allows users to explore folders only if he/she has the permissions to access them. On Windows, you need to be an administrator to explore the folder where system files reside. In Linux, only root users are allowed to browse critical and most important folders. Frankly speaking, you don’t have to fiddle with your system files unless you’re developing a customized version of the OS. If anything goes wrong, your device will stop working. But you can safely work with files you’ve created or saved on the storage hardware of your device. Windows and Linux desktop operating systems come preinstalled with an excellent file manager tool that offers plenty of functions and tools. File managers for mobile phones have basic features, and you probably wouldn’t like to use them. The most advanced OS for mobiles i.e., Android allows users to publish their app on Google play store. Thus, some developers have launched their file managers that offer plenty of advanced modules that you’ll not find in the similar utility on the stock Android OS. The best file manager app among them is undoubtedly the ES file explorer (ESFE). ES has 1.5 million reviews with a great rating of over 4.0. It has been downloaded on more than 300 million Android devices to date. Even Cheetah mobiles have introduced a file manager app for Android, but it is not as popular as ES. Its app has half a million ratings. Getting started: How to use ES file explorer? To get started with ESFE, you should install the app on your Android tablet or phone. Hence, connect to the internet network and install this app by searching for it on Google play store. After installation, locate the app on the home screen and tap on its icon. If you’ve stored ES file Explorer APK on your PC, move it to the SD card of your device, open the folder where the APK is saved and tap on it. Well, the file explorer app has now been installed on your phone. 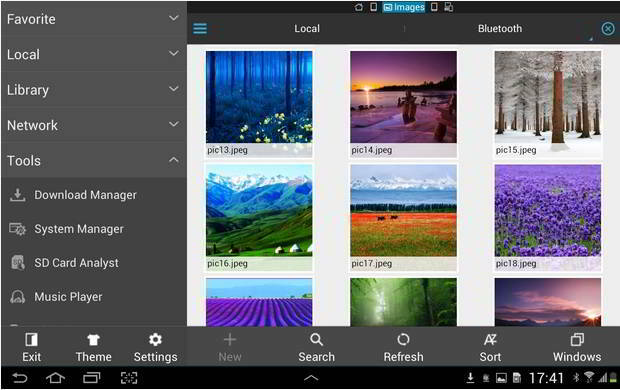 After running it, you’ll find the below features and tools in ES – the best file manager for Android. With this utility, you can get details on the available or used memory of your handset’s ROM and microSD card. The interface also displays a total count of images, music, video, document and APK files stored on your phone. Finding files on phones with ESFE is easy, thanks to its inbuilt searching feature. This tool is fast, and you can use it to find duplicate folders and archives. Relevant matches will be displayed on the fly when a character is entered in the search box. This tool is not easy to use as users must type the URL of the file they want to download. Most browsers include the download manager utility. Hence, you can ignore this feature of ESFE if you’re not comfortable with it. Some tablets and phones will slow down when the user tries to access files and videos stored on ROM or SD card in thumbnail view. If you’re experiencing this issue, try changing the default view to the small list/detail in ES explorer. To find files faster, you can sort them by size, type, last modified date, and name. Sharing files between remote PC, Android TV, and the phone is a piece of cake in ES. To connect the two devices, tap on the new button and select the connection type. Now, fill the details that you see on the screen. You must turn on WiFi or Internet connection to use this feature. For example, for connecting to an FTP server, the user will be prompted to enter an IP address, port, username, password, etc. ESFE supports secret file sharing operations. It has a scan button. Tap on it to find and discover new networks. Unfortunately, this feature didn’t work on my device. ES supports connection with cloud storage services like DropBox, Amazon S3, Google Drive and Amazon S3. When you select a cloud service, this app will open the login page where you should enter your email address along with a password. If you’re a first time user, you can create a new account with cloud storage platform supported by ESFE. Users should use this tool to find and close the tabs opened by Easy file manager for Android. They can also remove data copied to the clipboard. While using this app, you might find unnamed audio files. To help you in identifying songs, ESFE features an inbuilt music player that includes a filter to show audio files whose size is greater than 500 KB and a utility to save/open playlist. Here you’ll find all files with .doc and .txt extension. This utility displays all the apps installed on your phone. It also allows you to uninstall, share or create a backup copy of the APK. These three options will be visible only after you long press on the app’s icon. Tries to detect your location which I think is unnecessary for an Android, file manager. Links to Facebook and some other websites. Conclusion: After trying it out, I’ve replaced the default file manager on my Android phone with ES. This app is lightweight, fast and easy to use. ES is a perfect app for all types of Android phones and tablets. It has tools that makes sharing and management of files an easy task.